After a brief absence from the National Sports Collectors Convention, Fleer is returning to this great weekend in a big way. Fleer is once again bringing the popular spin and win wheel to the show where collectors can win Fleer cards, die-cast collectibles and more. To spin the wheel, collectors need to buy just one (1) pack of Fleer cards from any show dealer. Open your pack at the Fleer booth, give us your wrapper and spin away! 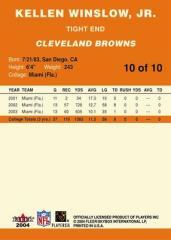 Inserted into the Sunday, July 18 edition of the Cleveland Plain Dealer will be a special-edition Cleveland Browns 9-card perforated Tradition card sheet. The sheet will feature nine players, but not Kellen Winslow Jr. To complete the 10-card set and obtain the Winslow card, collectors must purchase two (2) packs of any Fleer NFL product from a show dealer and bring them to the Fleer booth. 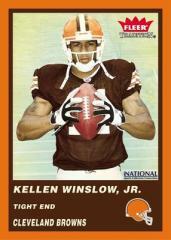 Collectors will then open the packs at the Fleer booth and exchange the wrappers for the limited-edition Kellen Winslow Jr. card. The card will be offered during all show hours while supplies last. Packs must be opened at the Fleer booth.